As a new parent, you feel lucky if you manage to shower before noon. Because you are so busy, exercise can end up at the end of your things-to-do list. Although it is hard to find time to exercise when your baby is around, you can achieve this goal as long as you keep the right tips in mind. 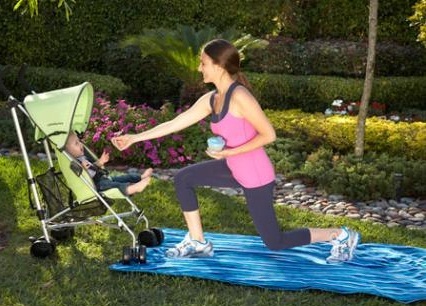 There are simple ways to sneak in exercise from lulling your baby to sleep with lunges to going for a walk together. Before going on a hike with your baby, think about his age and temperament. The length of your hike will depend on not only your stamina, but also that of your baby (about a half hour for babies new to this). If your baby is less than five months, opt for a front carrier which supports your baby’s neck and head. Once your baby is six to fourteen months, you can go with a sturdy back carrier. Always bring with snacks, avoid going out when the sun is at its highest point, and dress both you and your baby in layers. Walking with your baby is one of the easiest activities as you just simply put him in a stroller or a carrier and hit the road. Carriers give you the bonus of extra weight. You could even opt for a stroller class that uses cardio and toning exercises with the stroller. Don’t get a jogging stroller, however, until your baby is a year as that’s when he will have enough head and neck control. Either yoga or pilates will help with your strength and flexibility. There are even simple exercises for your baby as well (as long as he is four months). One option is to lie down on your back with your knees bent and feet flat down on the floor. Then hold your baby under his arms and prop him on top of your pelvis so he faces you. Inhale while bring your navel down towards your spine. Then exhale while lifting your back and bottom slowly off the floor until there is a straight line from your knees to chest. Inhale while rolling back down. You can either get a tiny “baby boat” for your baby to float in while you swim (but never take your eyes off him) or simply enjoy the water. 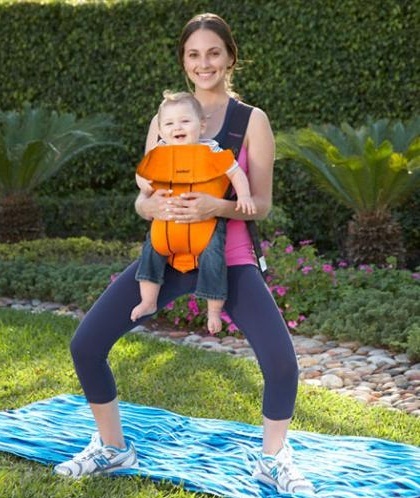 You can even use your baby as an exercise weight by holding him underneath his arms, lifting and lowering him in and out of the water. Dancing is great for you because it is a fun workout and your baby will enjoy the movement as well. Just remember to avoid jerky movements and keep the music volume low. You can do Kegel exercises at any time, even while you’re reading to your baby, getting him down for a nap, or nursing. Put your palms on a wall at chest height and step a foot or two away from it. Lean into the wall by bending your elbows and inhale for five seconds. Return to the first position while exhaling for another five seconds. Do three sets of ten exercises. Sit down on the floor, and your knees are bent with the feet on the floor. Put your hands right behind your hips with your arms straight, fingers forward several inches off the ground. Inhale while bending your elbows (but keeping the shoulders back) so you are lower to the floor. Exhale as you go back up. Do two sets of ten exercises. Lie down on your stomach, and put your baby in front. Bend your legs into a 90 degree angle and put your chin on top of your hands (which are in front of you). Flex your feet and lift your knees slowly up, being sure to squeeze your legs together so that your feet go toward the ceiling. Hold this for 20 seconds and repeat three or five times. Put your baby in a front carrier (if he’s light enough to help you. Otherwise, have him sit on the floor). Stand with your feet spread a bit farther than your shoulders and your toes slightly out. Inhale while lowering your body and exhale while raising it back up. Do three sets of twelve reps. This is a great exercise with baby. Face your baby while he is sitting in a stroller or high chair. Put your left foot three feet to the back and place your hands onto your waist. Bend both of your legs, so your right thigh sits parallel to the celling and the right knee is lined up with your ankle. Blow your baby a kiss before going back to a standing position. Do three sets of twelve reps on either side. Lie down on your stomach, so your baby is in front of you. Put your arms out into an airplane position, your toes pointed out, and your legs slightly wider than hip-width. Lift your chest, legs and arms off the ground for ten seconds. Repeat this ten times. Lie down on your back with your knees bent and legs on the floor. Keep your knees together and lift your legs up off the floor in a right angle with your calves parallel to the floor. Hold this for twenty seconds and repeat three times. You can put your baby on your belly for an added challenge. This exercise with baby is ideal for those who are crazy with their belly. First, lie down on your back with your arms by your sides and your legs going straight towards the ceiling. Draw the letters of the alphabet using your toes while you say the letter to your baby. Keep the movement slow and do the whole alphabet once.